SAN ISIDRO, El Salvador , May 29 2014 (IPS) - Mining is not viable in this country, say Salvador Sánchez Cerén – who will be sworn in as the new president of El Salvador on Jun. 1 – and his team of environmental advisers. The struggle waged by many rural communities affected by mining lies behind the position taken by the left-wing president-elect. One of the highest profile cases is the town of Llano de La Hacienda, in central El Salvador, whose 1,200 inhabitants mainly grow maize, beans and squash, and graze cattle – but who more recently have also been dedicated to fighting gold mining. Local residents were the first line of resistance against Pacific Rim, the Canadian corporation that sued the Salvadoran state in 2009 for refusing to grant it a permit for the El Dorado gold mine. The town is in the mountains of the municipality of San Isidro in the department or province of Cabañas, 65 km northwest of San Salvador. The mine is its unwanted neighbour. The company was acquired in November 2013 by Australia’s OceanaGold, for 10.2 mllion dollars. In this Central American country of 6.2 million, there were 18 gold and silver mines in 2004, some of them operated by local and foreign companies under concessions. Since 2008 no new concessions have been granted, but 74 requests are still pending. The mining industry accounts for 0.8 percent of El Salvador’s GDP, according to the report “Metals, mining, and sustainable development in Central America” published by Oxfam in 2008. But business sectors represented by the right-wing Nationalist Republican Alliance (ARENA), which governed the country from 1989 to 2009, argue that a suspension of mining activity would send out a negative signal to foreign investors. The lawsuit was initially for 77 million dollars, but the amount was increased last year to 301 million dollars, in a case being heard in the International Centre for Settlement of Investment Disputes (ICSID), a member of the World Bank Group in Washington. The decisive hearing is slated to be held in September. For the people of Llano de la Hacienda, the refusal of a mining permit to Pacific Rim was seen as a major triumph for local communities after years of intense opposition and social conflict that led, according to residents, to the murder of three activists between June and December 2009. 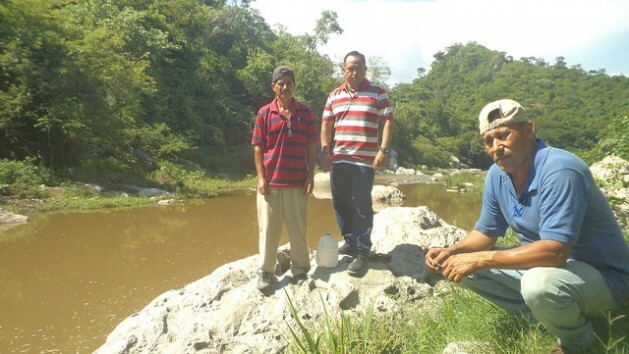 “Our entire struggle began over this river, to keep it from being polluted with cyanide,” local peasant farmer Juan Hernán Molina told IPS while resting on the banks of the Titihuapa river, which winds through the area’s hills and plains. Cyanide is a lethal ingredient used in gold extraction. The Titihuapa river runs into the Lempa river, the largest in the country, which supplies water to the capital, San Salvador. Another battle won by the environmental movement in El Salvador was an August 2013 ruling by ICSID which rejected a request by the Commerce Group, a U.S. mining company, to extend a 100 million dollar lawsuit against the Salvadoran state. El Salvador had refused to renew the permit for the San Sebastián mine in the eastern department of La Unión, which the Commerce Group operated from 1987 to 2009. In the case of Pacific Rim “a battle has been won, but not the war,” said José María Arévalo, another peasant farmer from Llano de la Hacienda. “What we want is for it to be definitively banned,” he told IPS, walking along a path outside the town. “In all of these fields there are holes drilled by Pacific Rim, when it was searching for gold,” he adds, pointing them out. Although the exploration work was brought to a halt, a small group of employees is still working in equipment maintenance and cleaning in the El Dorado mine, local residents told IPS. “We don’t support the idea of a moratorium, because it leaves the issue hanging, and gives companies time to prepare, whereas we want to just bring it to a halt once and for all,” said Héctor Berríos, a leader of the Movimiento Unificado Francisco Sánchez 1932 (MUFRAS 32) movement. For years, the San Salvador-based organisation has been supporting communities in the province of Cabañas in their fight against the mining industry. But neither the bill for a suspension of mining activity nor the one for a total ban have found support in the 84-member single-chamber legislature, where the right-wing parties, which have a majority, are opposed to both initiatives. Sánchez Cerén’s left-wing former rebel Farabundo Martí National Liberation Front (FMLN) has only 31 lawmakers, and is unlikely to drum up enough support to reach the 43 votes needed to move forward with the bill that would declare a moratorium on mining. 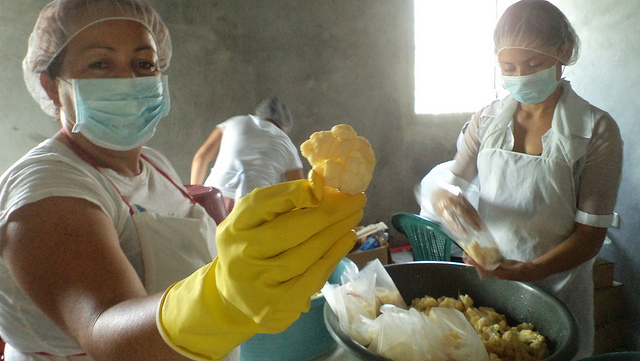 “The legislators should put themselves in our shoes, and look out for the health and well-being of the people and the quality of the water,” Roxana Ramírez, a young woman in San Isidro, told IPS while making pickles with three other women. They are taking part in a project aimed at showing that the municipalities around the El Dorado mine can develop and generate employment without the need for jobs and incomes from the mining industry. “This is an alternative that can be taken up again in other communities,” added Ramírez, as she placed pieces of carrot and cauliflower in small bags with vinegar. Sánchez Cerén, vice-president in the outgoing government, is a 69-year-old former schoolteacher and guerrilla who won the presidential elections in March, and who will have to prove that he will stand by his commitment to curb mining, which he repeated several times on the campaign trail. The people he named to the Environment Ministry indicate that he at least plans to try. As deputy minister he appointed Ángel Ibarra, an activist who played a leading role in the struggle against Pacific Rim and against mining in general, in the organisation Unidad Ecológica Salvadoreña (Salvadoran Ecological Unit). “The new president has reached the decision that mining is not viable in El Salvador,” Ibarra told IPS with conviction. But without the necessary number of votes in the legislature to push through a law to suspend or ban mining, it will remain a threat looming over rural communities.